What is the Difference Between Private Care and a Home Care Agency? HomeBlogPrivate Care or Home Care Agency? Private Care or Home Care Agency? Once your family has decided that a caregiver may be beneficial to you and your loved ones, you likely have a lot of choices to make. Should your aging loved one stay in their home? Are they going to want to have someone help them? What kind of home care should we go with? These questions are normal to ask yourself, especially during this overwhelming time in your life. Home care can be provided to you through an agency, such as 24 Hour Home Care, or you can hire a caregiver privately, such as a family friend or a caregiver you recruit on your own. Both routes ultimately give your loved one care the attention and help that they need, but did you know that both routes are not equal for the family? Agencies, such as 24 Hour Home Care, at first glance may seem more expensive than hiring a private caregiver. Rates will vary, but the rate that you are given and quoted with 24 Hour Home Care is all inclusive and gives you an idea of what you will be paying as a client. Private caregivers may choose to raise their prices at any given time and may charge you more for extra tasks, such as cleaning the house or preparing meals. 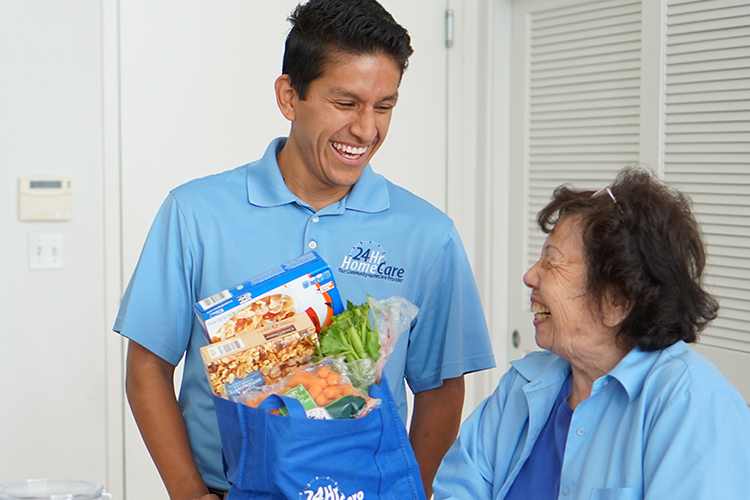 24 Hour Home Care gives you a rate for all services, including meal prep, light housekeeping, companionship, personal care and medication reminders. With 24 Hour Home Care, what you see and is what you get, and we will never charge you more money for additional services! Private caregivers are often found through websites, such as Craigslist, or through a referral. While this may seem like an easy task, the hiring process may be overwhelming, and another thing added onto you and your families plate during an already stressful time. You must make sure that the caregiver is qualified and properly trained to take care of your aging loved one. Screening and interviewing multiple caregivers can take days and even up to weeks. 24 Hour Home Care takes the stress of finding the right caregiver off your shoulders. Allow us to match you with a caregiver that not only is highly qualified to take care of your loved one, but they are meticulously screening and trained at the time they are hired. They are trained to be able to handle your family’s needs and will work directly with you to get an idea of what the client may need each day. Not only will 24 Hour Home Care handle the process of hiring your caregiver, but should you need to switch caregivers for any reason, including a caregiver taking time off, we will match you with another caregiver that will be able to come in and not miss a beat. When you choose to go with a private caregiver, if he or she is sick or wants to go on vacation, you are likely to be left without a back up plan. We are accessible to all our clients 24/7, 365 days a year. If your caregiver gets sick in the middle of the night, we will work diligently to replace them with another qualified caregiver so that your care plan will not be interrupted. However, should a private caregiver be out of pocket or call off in the middle of the night, you are left with limited options. This will ultimately become more of a headache for you and may cause additional stress. 24 Hour Home Care, as well as other home care agencies, have legal obligations to manage the process of paying the caregiver correctly. We are licensed, insured and bonded and take our legal obligations to our caregivers and clients very seriously. Private caregivers, although they can be paid under the table, could cause your family to miss out on tax benefits of hiring a caregiver through a home care agency. It would be advisable to speak with your family lawyer to get an idea of the legal obligations that you will have if you choose to employ a private caregiver. With a private caregiver, you are ultimately the employer, which can add more risk and stress to you or your family during your time of need. This time in you and your loved one’s lives may be chaotic, hectic and seem overwhelming to you all. As a reputable home care agency, 24 Hour Home Care would love the opportunity to give you and your loved ones a sense of ease by providing the best care to you. While you have plenty of options, 24 Hour Home Care vows to make this transition as seamless as possible. We are looking forward to the possibility of serving you and your family.